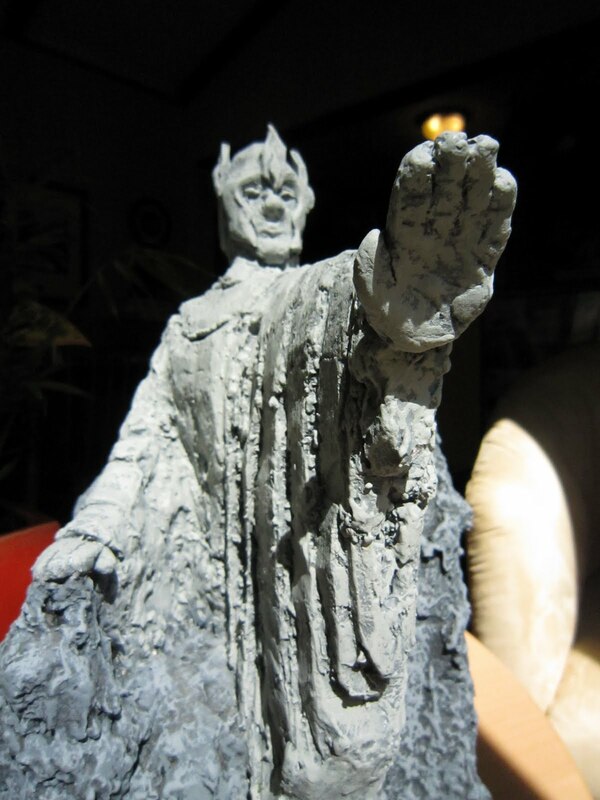 This is my interpretation of one half of the Argonath from Lord of the Rings. 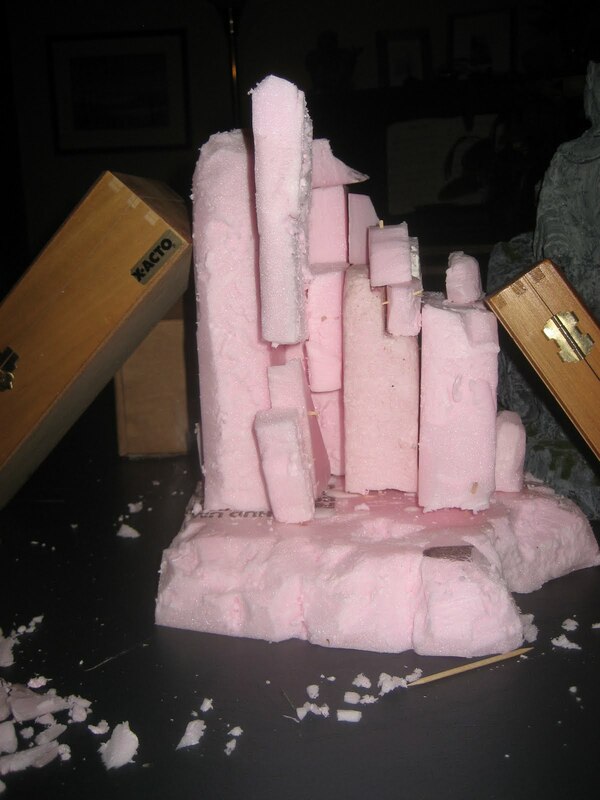 The sculpture is about a foot tall total, and mostly pink insulation foam. 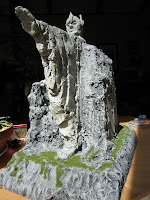 I used plaster for parts of the rocky texture, and to coat the figure itself, but the underlying form is all foam. The head is baked modeling clay. 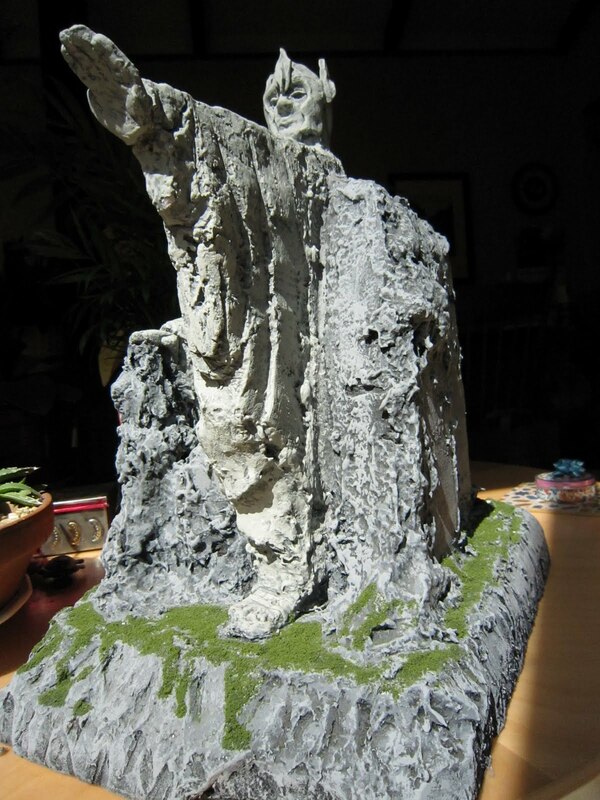 To keep the sculpture and the rock it is built from separate, I made them different shades of gray. The body started with a gray base and worked all the way up to a white drybrushing. 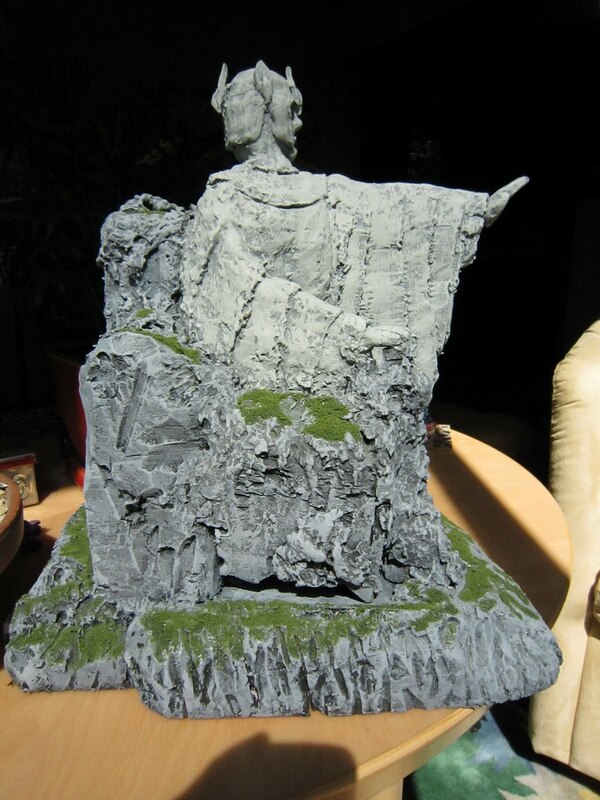 The rocks started black and worked up to a medium gray. I should note that it is a total pain to try to paint in small crevices that accidentally occur when using plaster, but the final texture does lend itself to shading in paint. The head was sculpted in two parts. First I made the face, complete with strangely pursed lips and large nose. Next I layered on the helmet. 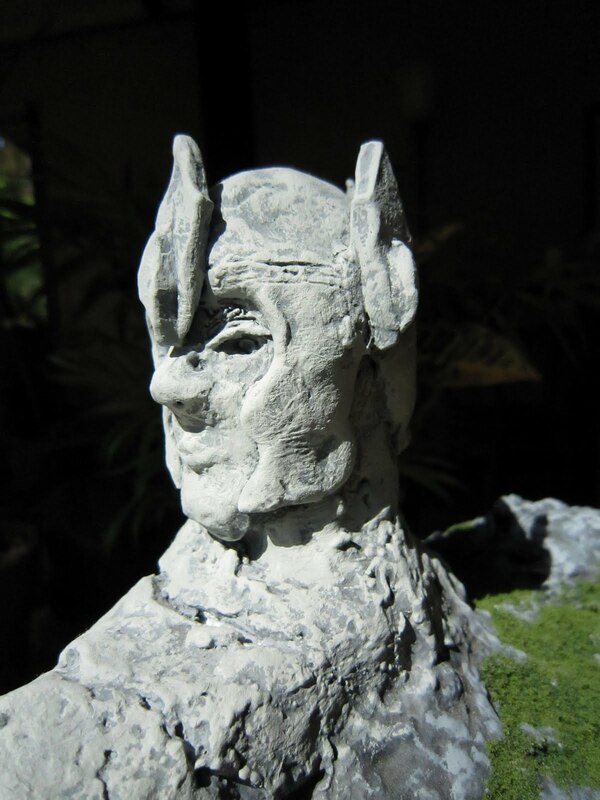 I sculpted the helmet once it was on the head, not before. By actually having a second piece of clay to make the helmet, I didn't have to mess around too much near the face to make the helmet look separate. This hand is also made from clay. The other hand and the foot (with sandal) were made by carving the plaster. In retrospect I should have made them all out of clay, because plaster does not take fine detail well (at least not the way I use it) and you have to deal with it setting as you carve it. 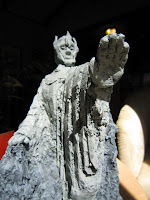 The robe is a combination of plaster and foam. Some of the folds were actually carved into the foam base (left arm), while others were made from plaster (right arm). To give you an idea of the construction, here are some photos of the second one which I started but have not yet completed. First you start with a foam base. 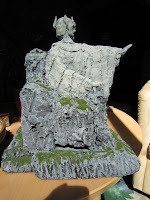 This base includes the rocks and the sculpture, which can be hard to in-vision at first. Then you add plaster. 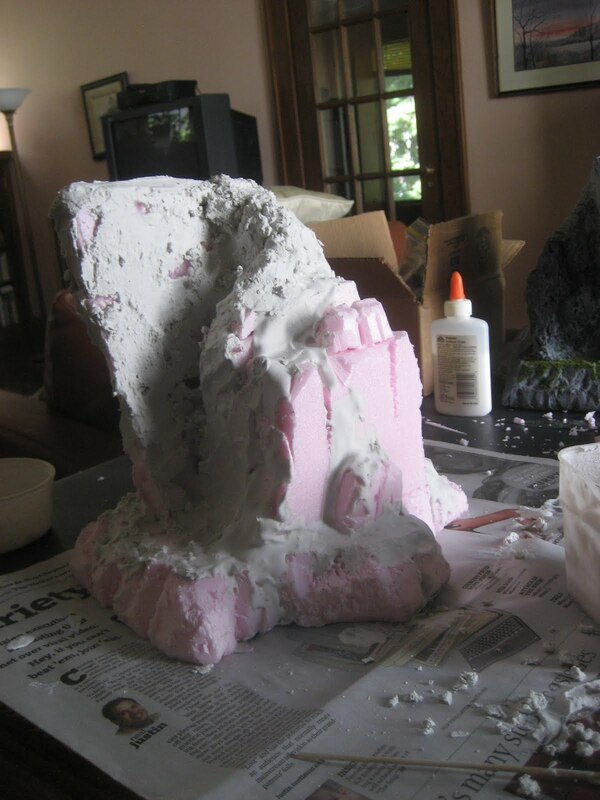 Once you've added some plaster, you can get a better idea of what you want the foam to be doing, and you can start carving the foam.